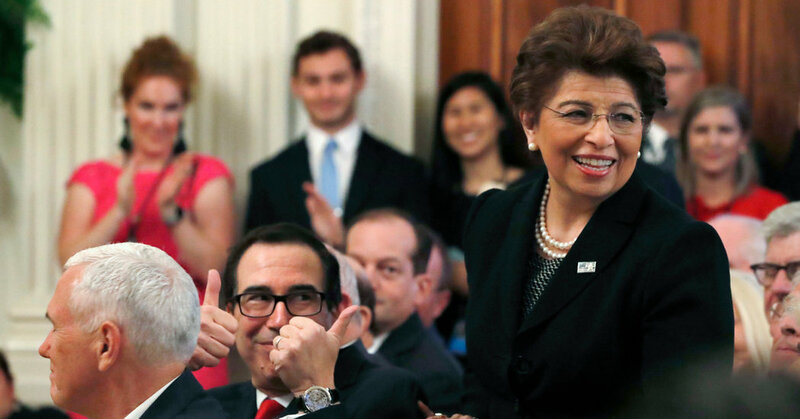 President Trump said Thursday that he would nominate Jovita Carranza, the United States treasurer, to lead the Small Business Administration, replacing the former pro wrestling executive Linda E. McMahon. Ms. McMahon, the former chief executive of World Wrestling Entertainment, stepped down as the agency’s administrator last week. People familiar with Ms. McMahon’s thinking said she was expected to take a position at the America First PAC, a political action committee supporting Mr. Trump’s re-election, where she is expected to help raise money. Mr. Trump announced the nomination of her successor in a tweet. At the Department of the Treasury, Ms. Carranza is currently an adviser to Treasury Secretary Steven Mnuchin, oversees the Office of Consumer Policy and works with the Federal Reserve. She served as deputy administrator for the Small Business Administration under President George W. Bush. Ms. Carranza also spent more than 20 years at United Parcel Service, where she rose from a box handler during the night shift to president of Latin American and Caribbean operations, according to her Treasury Department biography. If confirmed by the Senate, Ms. Carranza will be one of five women in Mr. Trump’s cabinet. During the 2016 election, she served as a member of the National Hispanic Advisory Council for Trump. In announcing Ms. McMahon’s departure, Mr. Trump called her a “superstar” and “one of our all-time favorites.” Ms. McMahon was one of Mr. Trump’s most prolific donors during the 2016 presidential campaign and assumed the position of administrator early in his term. She ended up earning the respect of some Democrats, who praised her for expanding loans to women and for working to make the agency more efficient. Ms. McMahon said last week that she would formally resign on April 12. Next PostNext Scott Gottlieb Says He Will Return to Conservative Think Tank After Leaving F.D.A.